Akit's Complaint Department: What's the Policy for Riding Muni Buses when Transfer Expires During Trip? 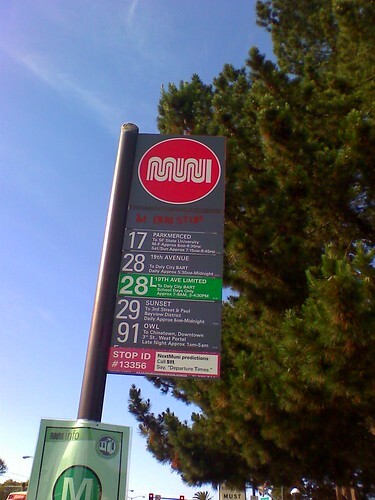 What's the Policy for Riding Muni Buses when Transfer Expires During Trip? What is Muni's official policy when a transfer expires while in journey on a non "Proof of Payment" line? I have to ask this question because the SFMTA/Muni posted a new campaign on fare evasion as well as updated their "Proof of Payment" policies in coordination with the Clipper card. The expired transfer policy on buses (NOT TRAINS) has been a frustrating policy and the fear of fare inspectors giving out $75 tickets makes the matter worse. During SFMTA board meetings, public commentators express that if they ride a bus line like the 30-Stockton and it expires during their journey, they allegedly claim the passengers get ticketed by the fare inspector for an expired transfer. I originally stated in April the policy was confusing, but while doing very in-depth reading, it is clearly separated between metro vehicles and non-metro vehicles. For metro vehicles, an expired transfer is bad. But for buses, an expired transfer during the journey is OK. It's time for Akit to ask the hard questions to Muni officials. I expect a response. The transfer must be valid during the entire trip, that includes waiting at paid waiting areas. If the transfer expires during the journey, a passenger must pay the driver, or if in subway, can also go up to surface to pay. "Don't get stuck entering with a transfer/fare receipt that will later expire while you are waiting on a platform or riding in a vehicle. If you are not sure your transfer/fare receipt will last, then pay for a fresh transfer/fare receipt on the surface or at a faregate in the subway." This sounds a little confusing. What is a definition of a "vehicle" in this context? Does it pertain to metro vehicles only or all vehicles (including buses)? To make matters worse, when it comes to their FAQ section titled: What if you lose your Proof of Payment? What if your Proof of Payment expires during your trip? "There is no need to correct the problem on non-POP lines, but you will not be able to subsequently board a POP line or enter the paid area of a subway station without obtaining Proof of Payment." This tells me if I ride a non-POP line (buses), if my transfer expires, I don't have to do anything, and I can continue riding without being cited/ticketed by a fare inspector. Two conflicting statements... so what's the answer? OK SFMTA PR folks, let's get your official answer. If my transfer expires during the journey on a bus (but was valid upon boarding), what's the rule? Will I get cited for an expired transfer by inspectors? Not sure what you mean by non-POP line. All of what I have read explains that every bus, train and platform is POP. "You must have valid Proof of Payment when riding on a Muni rail line or bus route or while within the paid area of Muni stations." Proof of Payment is required for all Muni lines as inspectors can check if a passenger has a valid pass or paid their fare with a transfer. Proof of Payment is also defined to differentiate the metro lines vs. the non-metro lines. Metro requires valid "proof of payment" which is a valid pass or non-expired transfer during the entire journey. Non-POP lines are defined as the buses and F-Market where a valid pass is required or a non-expired transfer upon entry (OK to expire during journey). From the context of the second sentence, it seems to me that the definition of a "vehicle" pertains to metro vehicles only because it talks about "pay[ing] for a fresh transfer/fare receipt on the surface or at a faregate in the subway." But if a person were to just read the first sentence alone, they would not be able to figure out the definition of a "vehicle." So yes, I would have to agree that the first sentence sounds a little confusing.